Fuchsia is enough to add a pop of freshness. Getting this bold color accented with a color as classy as navy, guarantees to provide the most eye catching decorations. An addition of gold would bring an antique allure. Try fuchsia for bouquet, boutonnieres, groom’s party’s ties, fashion accessories, floral arrangement, and bridesmaid dresses. Golden vases, furniture, candle holders, jewelry and cutlery bring the best vintage aura. Navy table linens, groom party’s suits, bridesmaid’s dresses, wedding cakes and a lot other can be tried. Fuchsia, when combined with yellow and white, creates the sassiest and funkiest decorations. 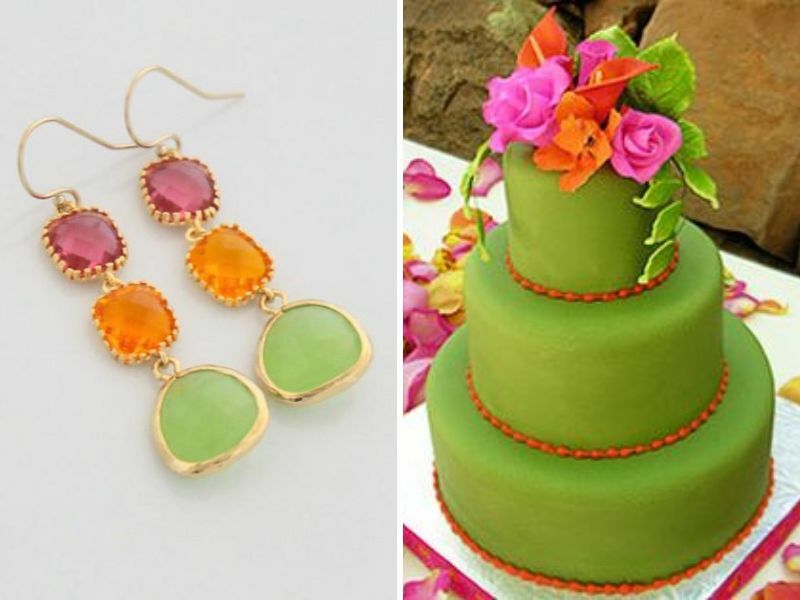 It’s a perfect combination for garden and destination wedding especially in spring or summer. 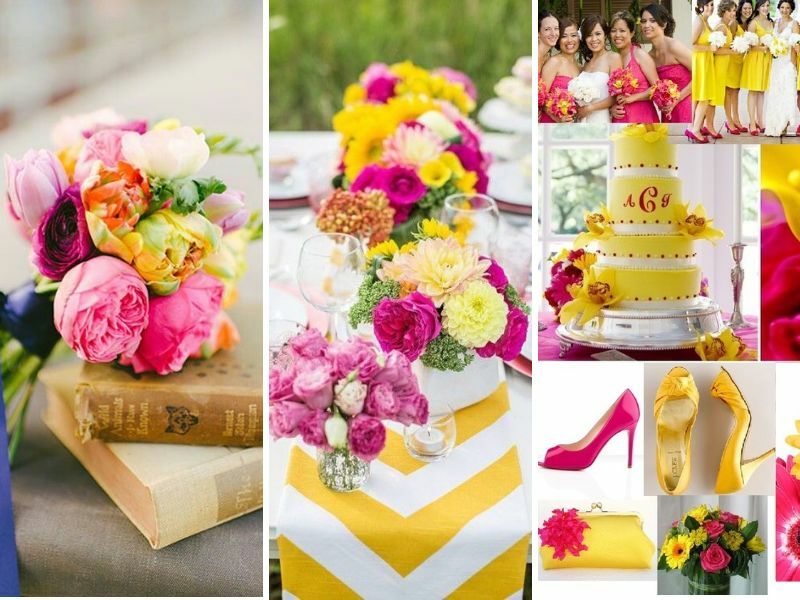 The freshness of yellow and bold fuchsia with white accent, can be dramatically combined in tablescaping, floral arrangements (each season brings fresh flowers in this color palette), corsages and desserts like wedding cake, cupcakes and macarons. 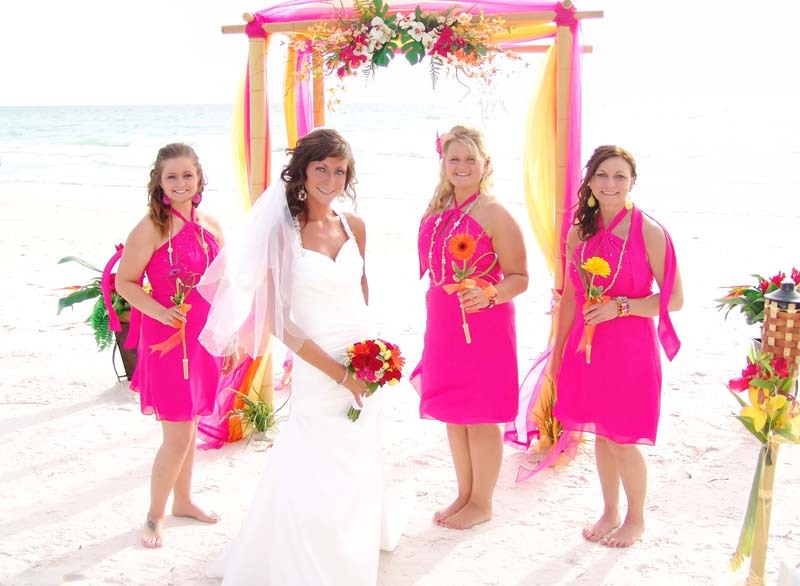 Fuchsia bridesmaid’s dresses with fresh yellow flowers gives a refreshing look. 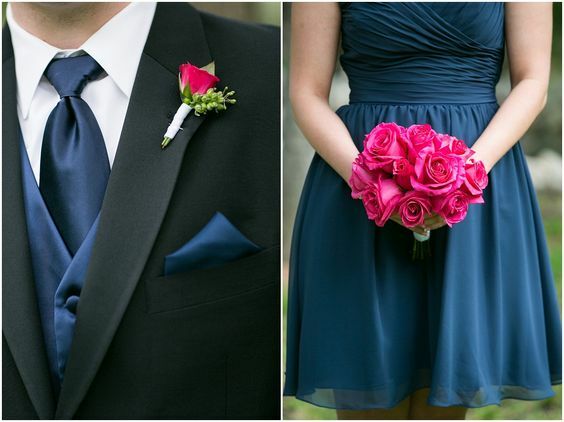 Groom’s party can add these colors in their boutonniere, socks or ties. Looking for what color matches fuchsia? 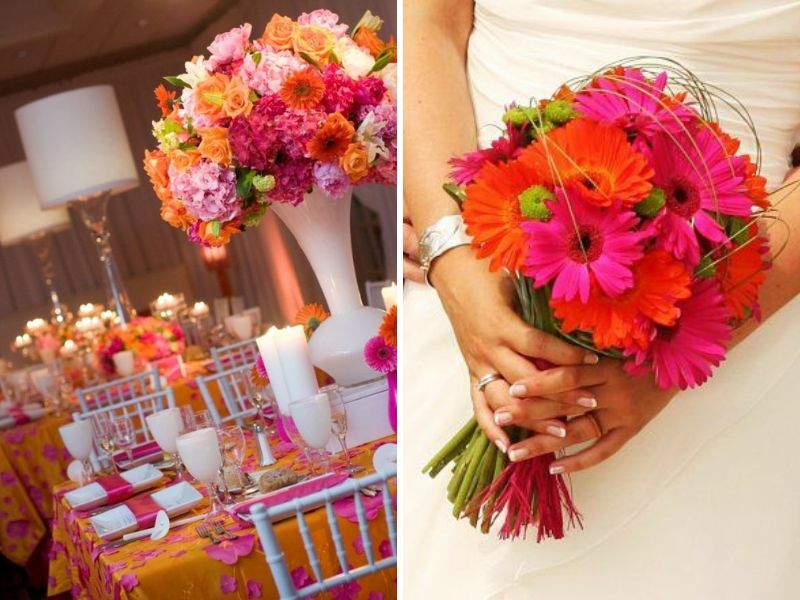 Want to experiment with a wedding color palate more sizzling? Try cobalt, a fresher shade of blue. The combination has the power to show off your playful style. It is recommended for outdoor daytime weddings, especially the beach weddings. 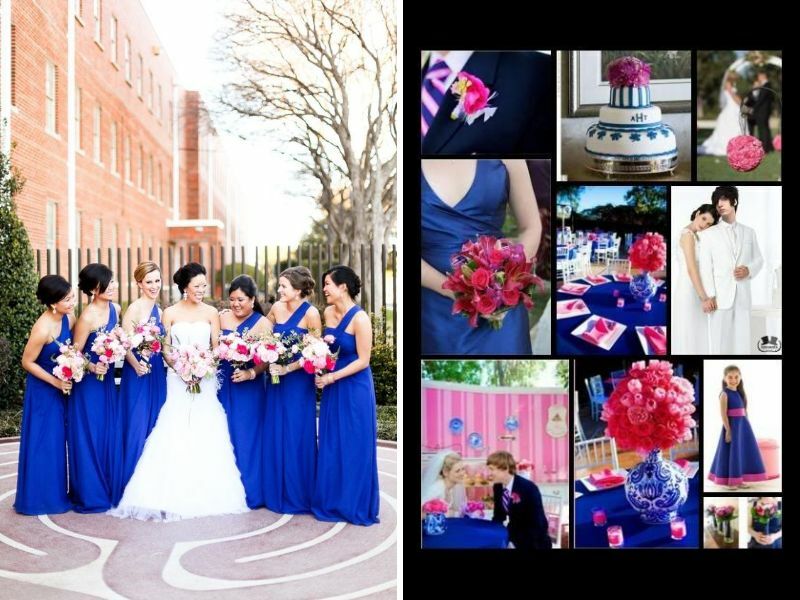 Cobalt bridesmaids holding fuchsia bouquet with fuchsia fashion accessories, are just picture perfect. 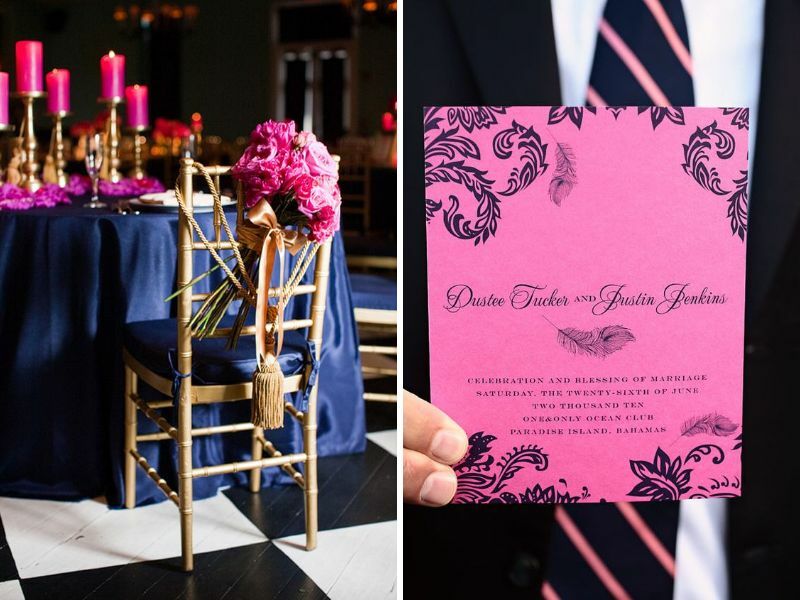 Cobalt table runner with fuchsia centerpieces, fuchsia and cobalt tie for groom’s party, all combine to give you the best. 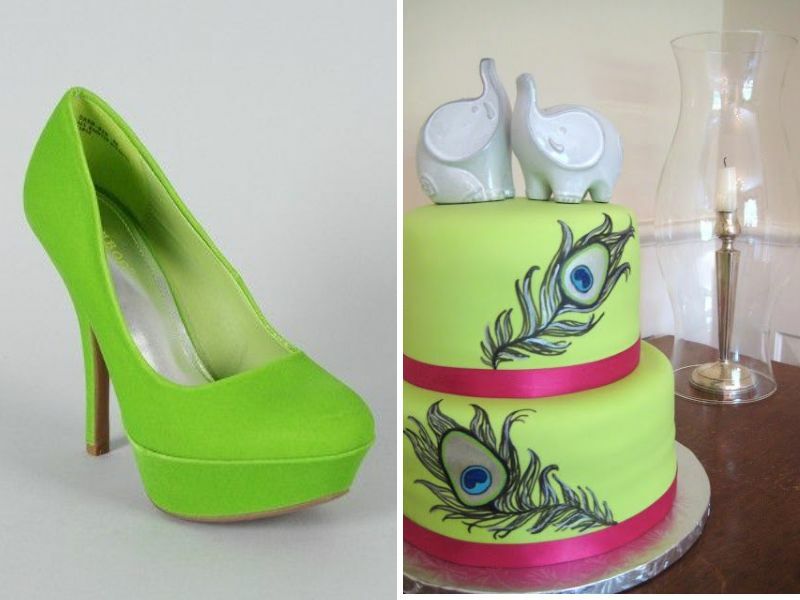 For a funky and fun loving couple, this combo is a big YES. All three colors are striking and signify freshness and vibrancy. Using these colors together require a great sense of understanding, in term of colors. Otherwise it could turn out to be a cheesy palette. 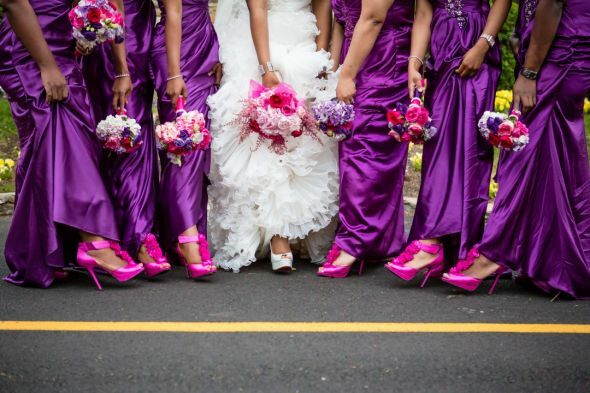 Fuchsia is best for bridal party dresses. For floral arrangements both main hues are best combined with green foliage. For groom’s party a boutonniere of fuchsia or orange with green leafy accents and a vibrant tie would look fab. 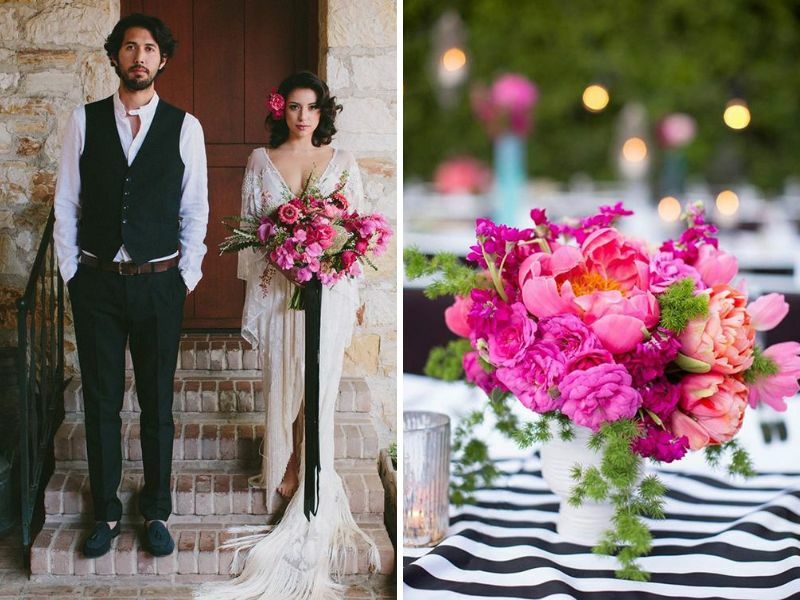 Are you looking for the best color palette for a beach wedding? 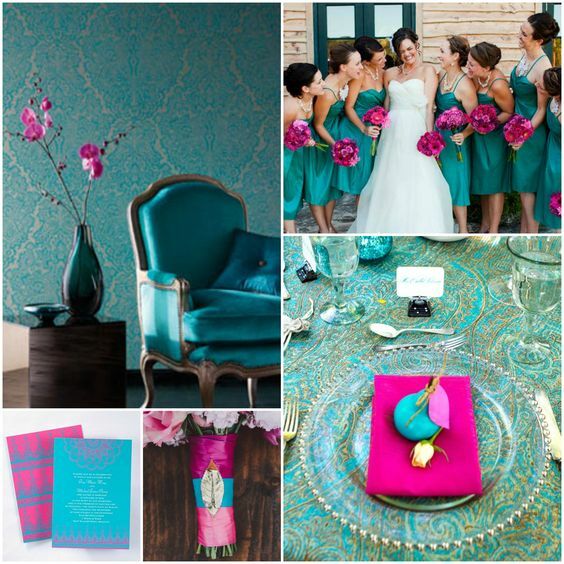 Try the most romantic teal with the most fresh fuchsia. Sea water in the background would complement the whole view. 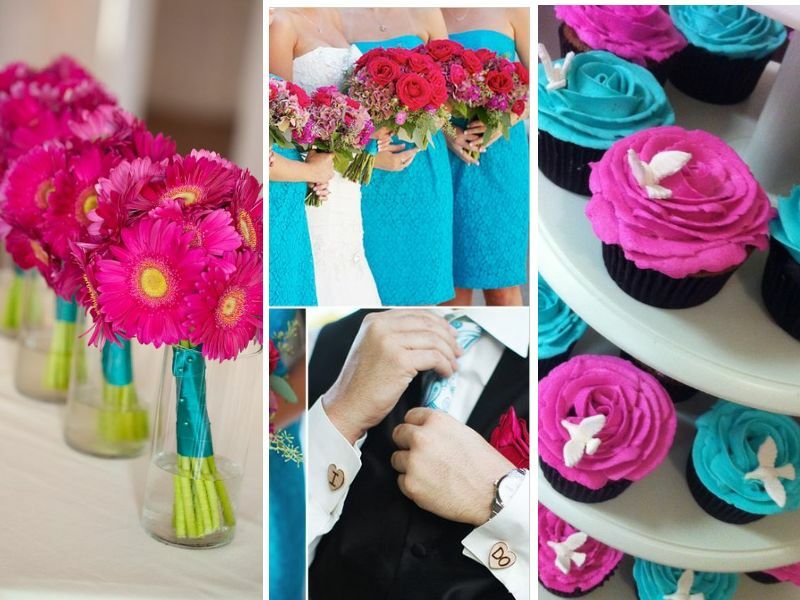 Teal bridesmaids with fuchsia bouquets, freshly colored cupcakes and other desserts, and a wedding alter with teal and fuchsia drapes, all would add a stylish glow to your event. For groomsmen, try teal ties with any neutrally colored tux. 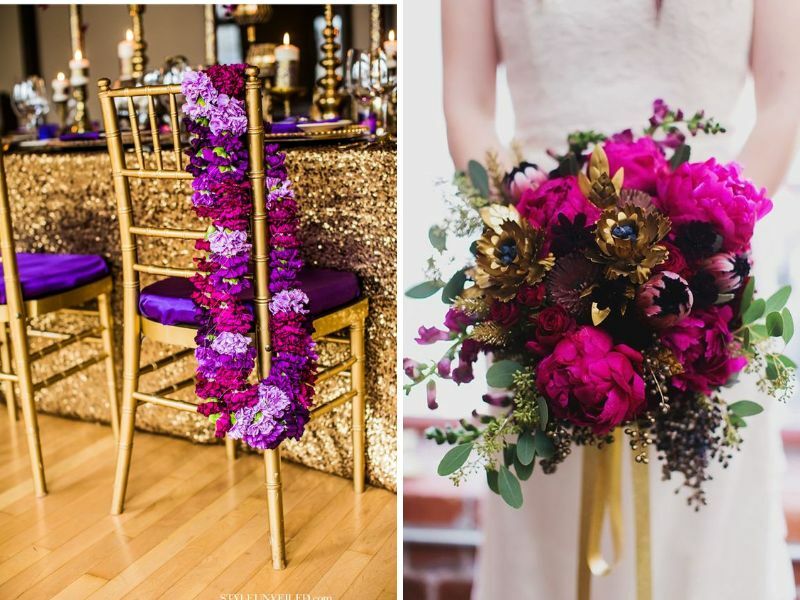 What color matches fuchsia in a winter wedding? 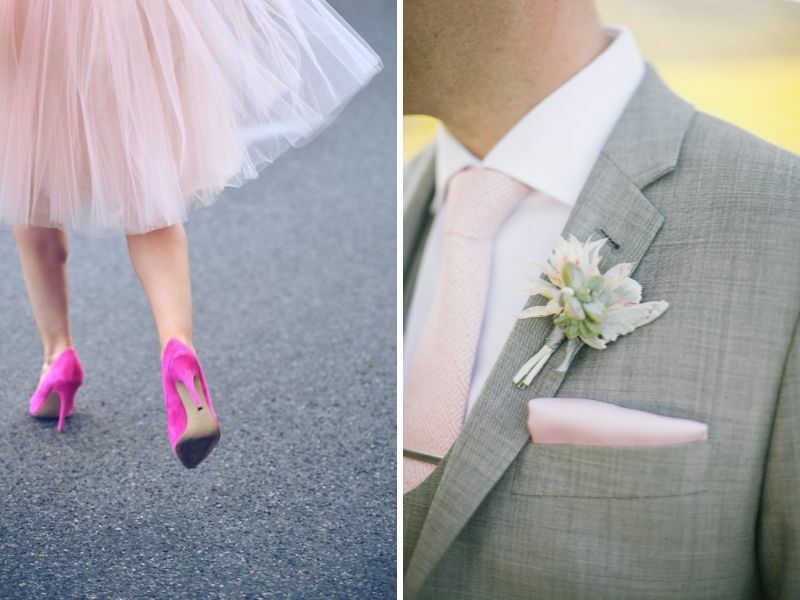 A comparatively dull shade like grey is best elevated with the touch of bold pink, for winter weddings. Fuchsia décor in flower, centerpieces and tablescaping look great on grey background. 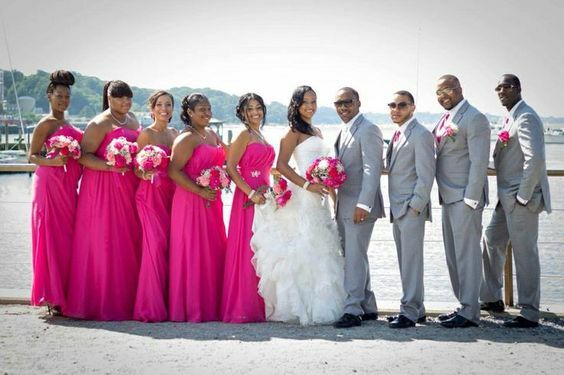 Bridesmaids in pink and groom’s party in grey, complement each other beautifully. 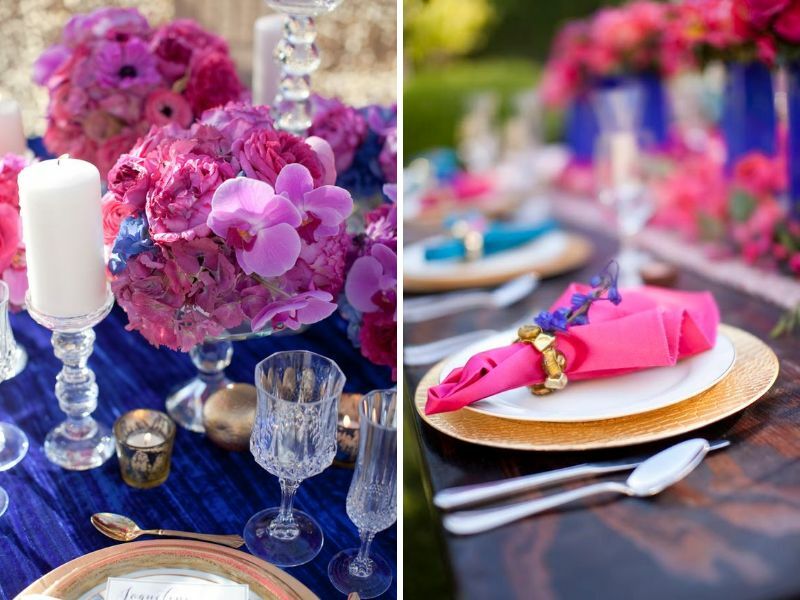 Try a grey table linen with fuchsia table runner or centerpiece. 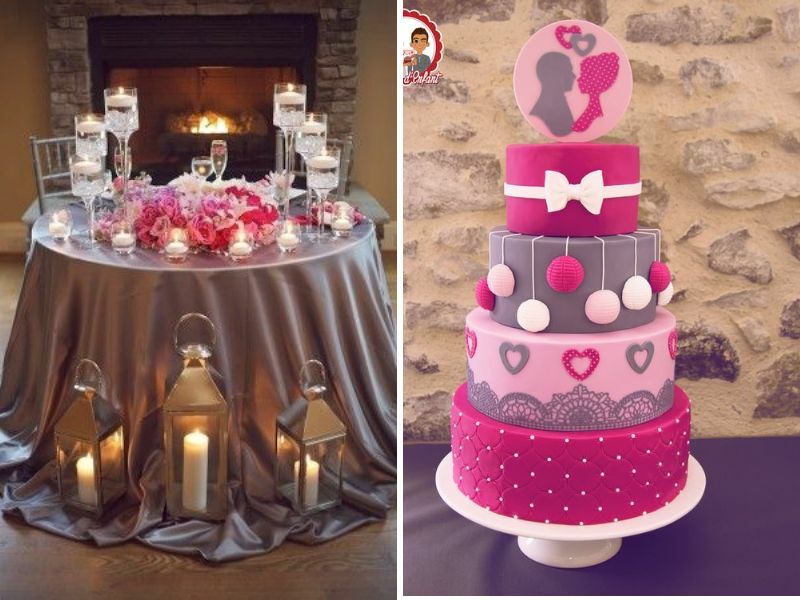 For desserts, grey and pink cake pops and wedding cake, add more to the overall decor. 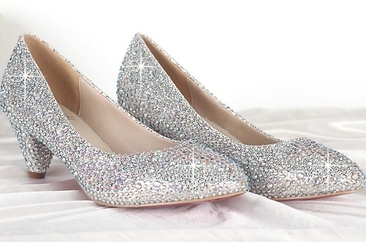 This one is a perfect combination for a fashion savvy and chic bride. Black and white striped table linen or runner give an elegantly romantic ambiance to the whole event. 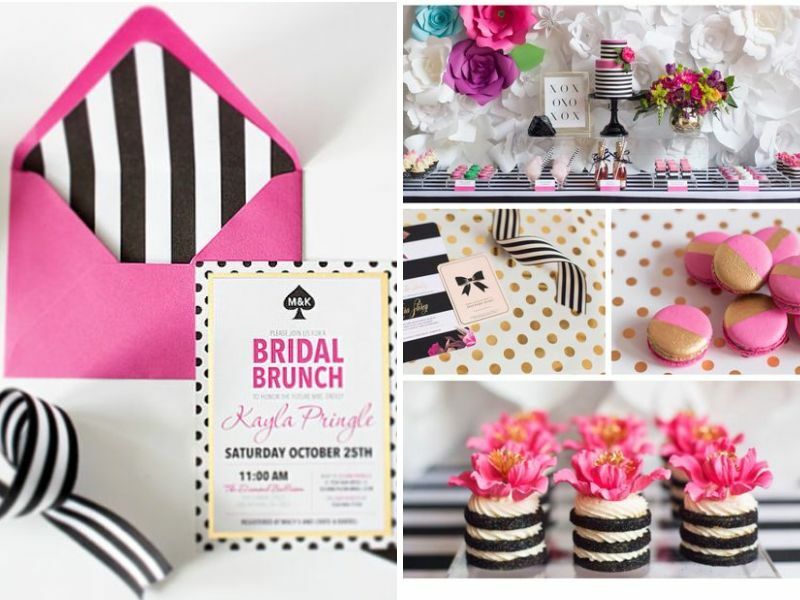 Striped black n white wedding invitations with fuchsia look classy. 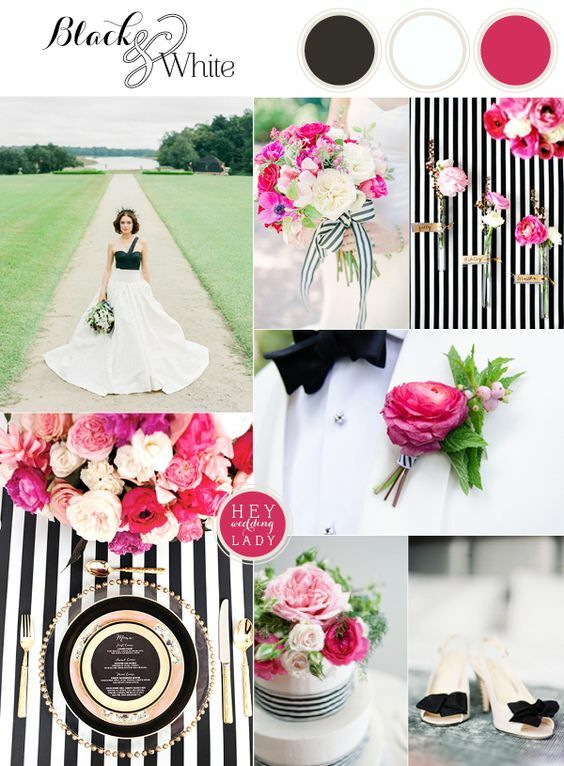 Grooms party can opt for a white tux with black bow tie and fuchsia boutonniere. For dessert, black and white striped cake with fuchsia topping look fab. 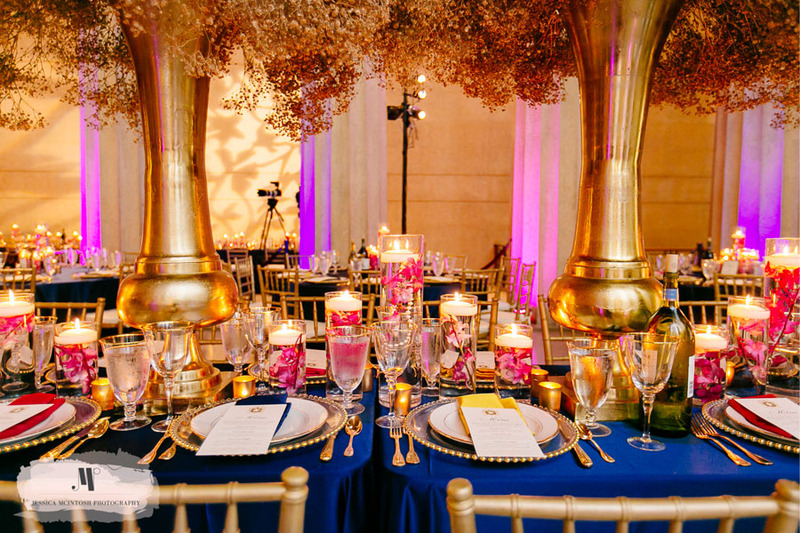 For fall or winter indoor weddings, nothing could be classier than this elegant combination. 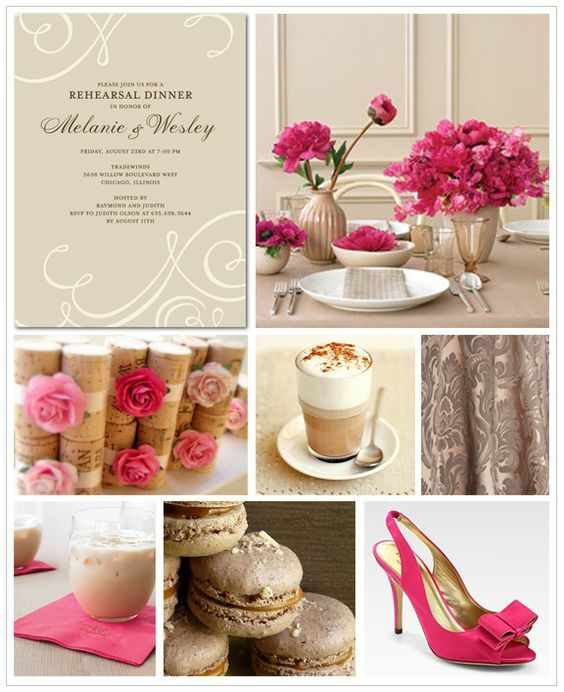 A dull shade like taupe is exceptionally elevated with fuchsia. Taupe vases with fuchsia flowers like peonies and anemones would flatter from every angle. Bridesmaids with taupe gowns with fuchsia bouquets, groomsmen with taupe tux and pink boutonniere, all make a picture perfect decoration. 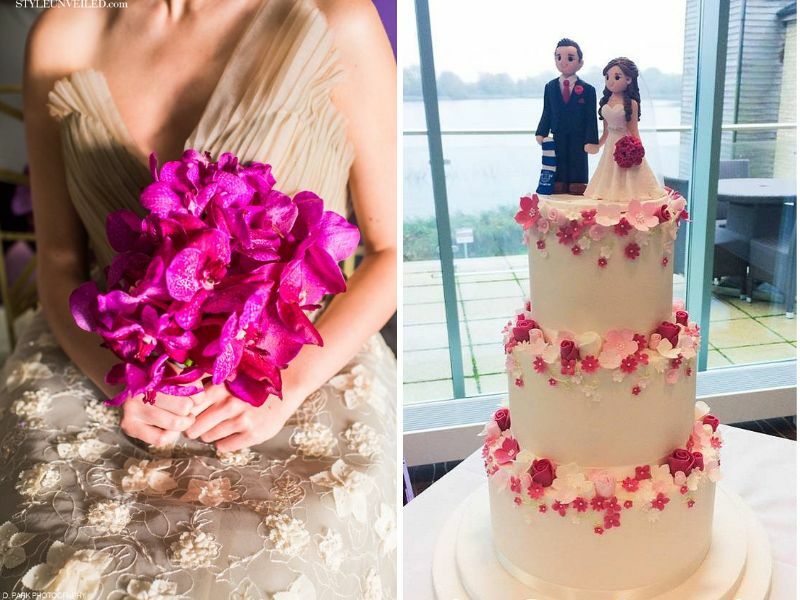 Taupe wedding cake with fuchsia topping and other colorful desserts add a chic appeal. 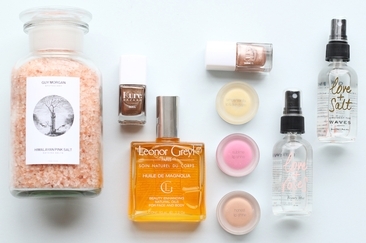 Try the most romantic color palette on our list. 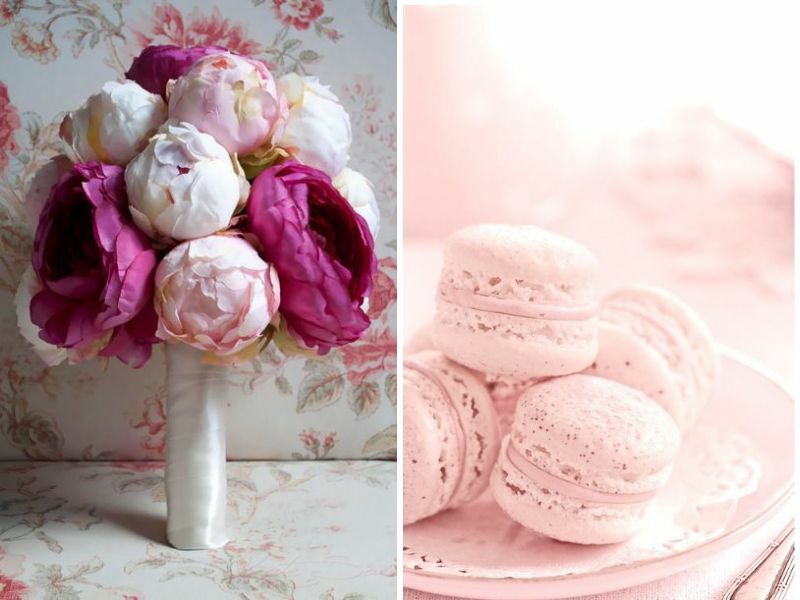 Pink is the shade that is trendy for all the wedding seasons. Both pale pink and fuchsia, when combined, produce the easy on eyes results. Pale pink bridesmaids dress with matched accessories and a bouquet of flowers in both shades, gives a soft and flattering look. 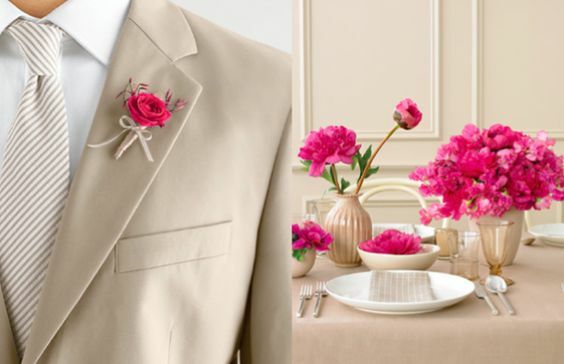 For groomsmen, a pale pink tie and boutonniere seems good. Talking of desserts, they are a treat for eyes. 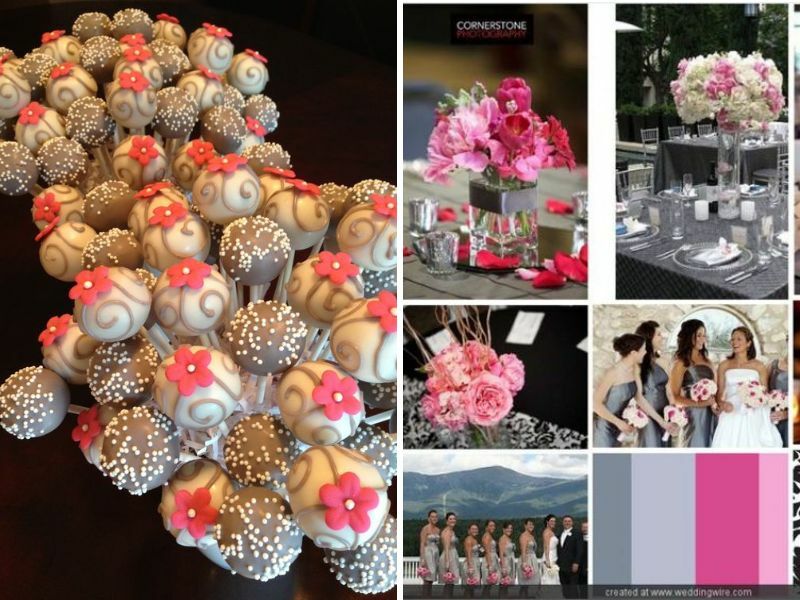 Floral arrangements and corsages, all are given a new dimension using these colors. 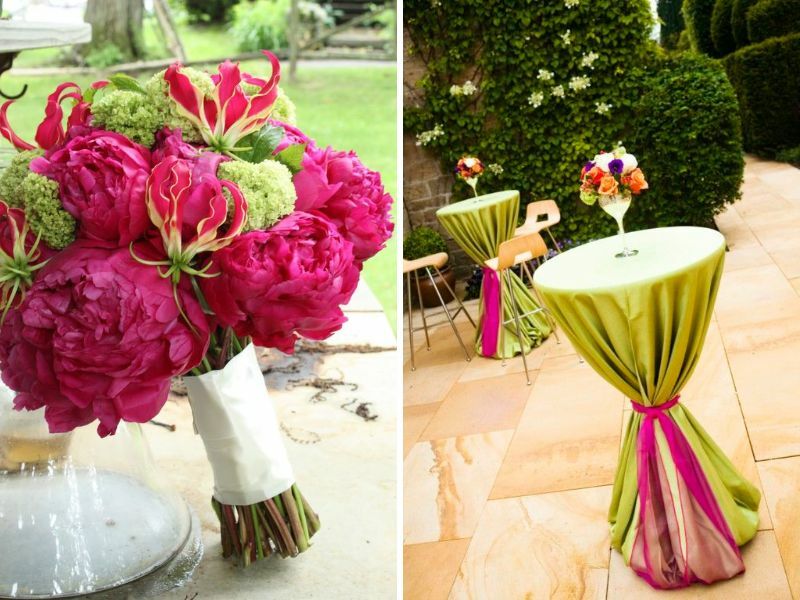 If a garden wedding in daytime is what you are planning for, you might feel confused about what color matches fuchsia. 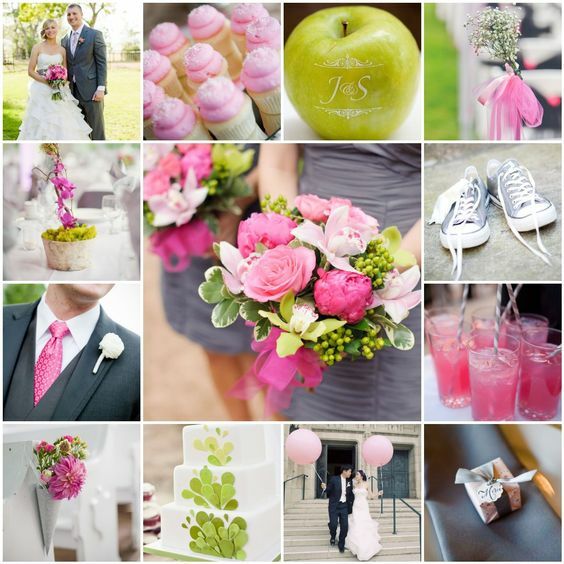 Fuchsia pink when combined with fresh apple green for wedding decor, promises to bring some of the best decor. Both shades can be used for bridesmaid’s dresses. 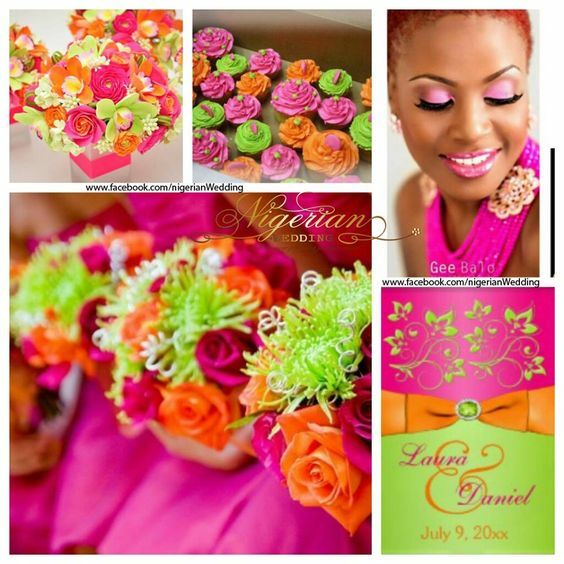 Floral corsages and bouquets with fuchsia flowers with apple green accents look refreshing. 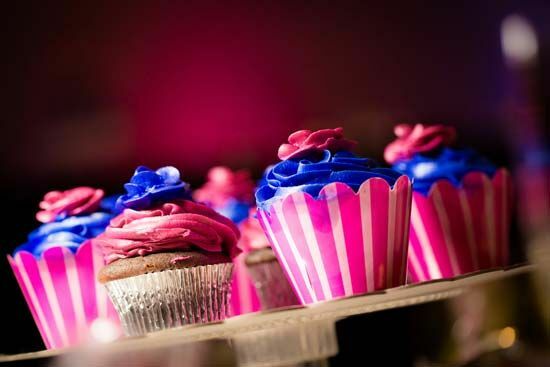 In desserts, fluffy pink cupcakes and a stunning wedding cake give some of the best visual effects. This combo gives a royal touch to your evening reception. Addition of gold or metallic touch glamourizes it. 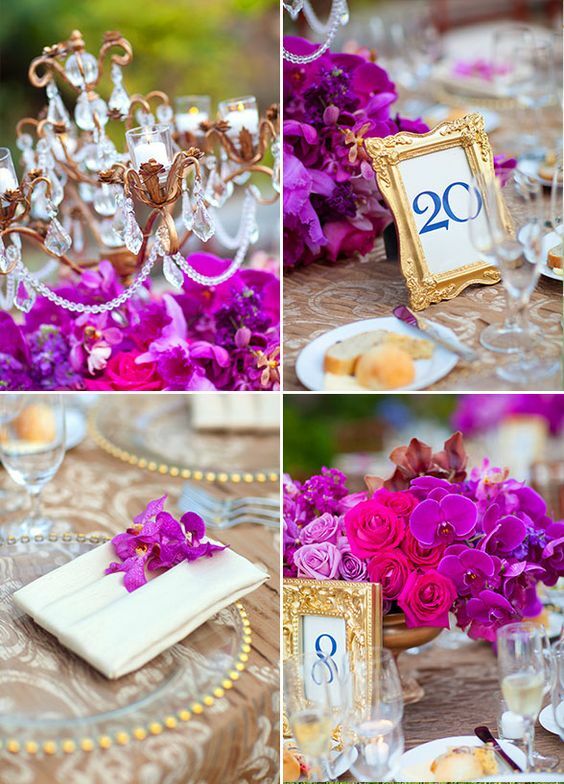 From tablescaping to floral arrangements, the combo guarantees an appealing look. Purple outfits for bridesmaids, purple and pink flowers bouquet, colorful boutonniere or tie for groomsmen and lastly, vibrantly colored desserts, complete the wedding looks. 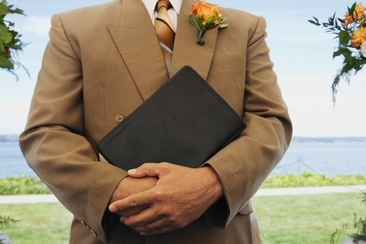 Find out how to get ordained to marry and make the dreams of a lucky couple come to life. There are also a number of pitfalls you should be aware of. 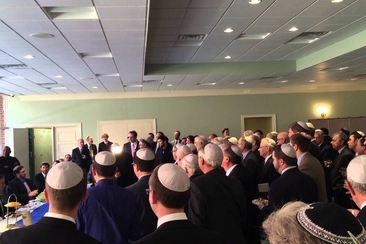 Plan on having a traditional Jewish wedding ceremony? Make sure you have known most important traditions in Jewish wedding and include them in as you like or need. Tape, pins and more! Which are the best ways to keep a strapless dress from falling? 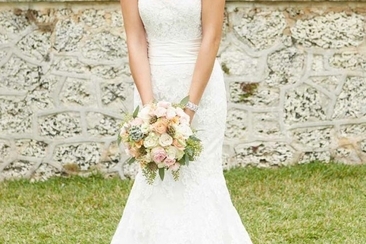 This article features 8 ways to avoid any dress malfunctions on your big day! 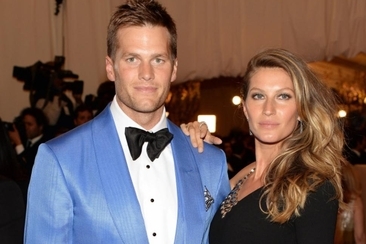 Tom Brady and Gisele Bundchen is one of the most stylish celebrity couples. How they met and came this far as a perfect couple? What’s the wedding like? All the answers are here.